Every now and then on my road-food travels, I run across a joint that’s a perfect match of ambience and food quality, a spot that’s just a delight to be in, on all counts. 5 Points Market & Restaurant, just south of downtown Tucson, is that kind of place. First, the location. 5 Points shares a historic building that was once a rag factory. Inside, it’s all lovely wood and exposed brick, with tables at the front, a little grocery at the back and an open kitchen in between. Right in front of the espresso machine (using local Café Aqui beans) is a mouth-watering display of decadent sweets, highlighted by a three-inch-high fruit pie. But we’re here for breakfast, showcasing foods that are local, fresh and natural. The menu manages to be both original and brief: only eight items long. How about a breakfast salad, featuring butternut squash, roasted poblanos, over-medium eggs and heirloom greens? Or a bandito blanco, with poached eggs atop a mustard potato pancake and grilled, shaved ham? All perfectly executed and arranged. So how good is 5 Points? I’d say if you’ve only got one Tucson food stop to choose, I’d make it this one. The only worrisome thing is, as we are eating, I see a magazine ad listing the 5 Points Building for sale. Just please, don’t touch this gem of a restaurant. This entry was posted in Arizona, breakfast, road food, road trip, Road trip food, Tucson and tagged Tucson restaurants on April 27, 2017 by bcorbett907. Many western Canadians, desperate to escape the ever-lingering vestiges of winter, often take spring road trips to U.S. hot spots like Palm Springs or Scottsdale or Moab. But after recently spending 10 early-April days in Tucson, I’d like to recommend the southern Arizona city as a worthy springtime destination for outdoor activities. Sure, the temperatures can creep into the 30s Celsius (90s F), though the desert nights cool off remarkably. The trick is starting your hike, bike ride or other outdoor activity as close to sunrise as you can manage, get in a few hours of exercise and then spend the rest of the day more idly in the shade or air-conditioned comfort. Once the sun sets, you can re-emerge in the glorious night-time air for, say, a shirt-sleeve patio drink/dinner or outdoors concert. All this means is it takes awhile to drive anywhere, especially with traffic lights that leisurely go through their cycles. But the traffic never gets L.A. or Phoenix hellish, though it really shouldn’t given the city proper has a population of just 530,000 (1 million metro). On to the activities. I’m not a cyclist, but an amazing number of road bikers either live in Tucson or make dedicated trips to the city. They range from racers here for serious winter training to those seeking more leisurely rides along the tremendous 100-plus-mile Tucson Loop, which winds through the city. The real test piece is the 26-mile-mile grind up Mount Lemmon, a climb of nearly 6,000 feet. Followed by a blazingly fast descent (average 4.3% grade), which obviously delights roadsters but would scare the road-rash bejesus out of me. But we’re here for the hiking, and it’s wonderful in spring. There are hundreds of miles of trails scattered around the five mountain ranges surrounding Tucson, highlighted by the two chunks of Saguaro National Park that bookend the city. The trails go up ridges, follow washes and explore valley flats. It’s principally Sonoran Desert hiking, featuring a wonderful foursome: the magnificent Saguaro (suh-wahr-owe) cactus, the orange-tipped, whip-like ocotillo and various forms of cholla and prickly pear cactus. Just don’t stumble onto them or accidentally grab their nettlesome thorns, or you’ll be like the dog that challenged the porcupine. Many of these species come into magnificent bloom in early spring, though the saguaro waits till May or June. 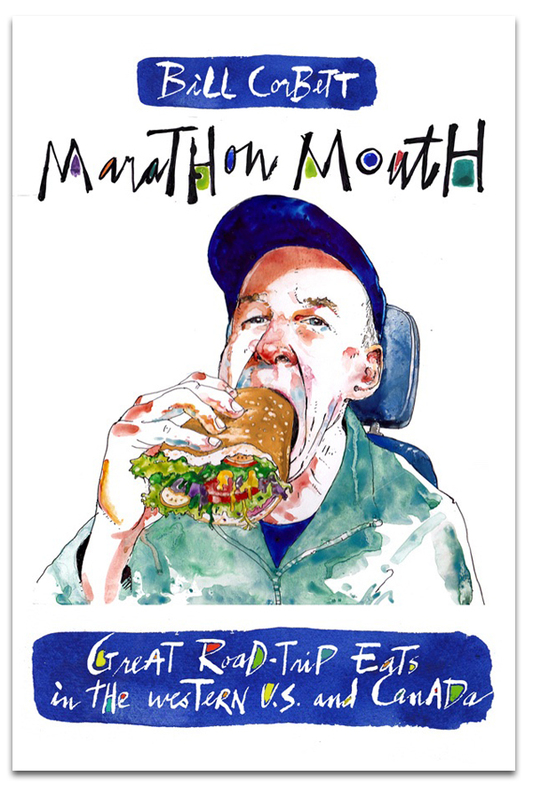 But what about the food, Marathon Mouth? Of course, being this close to the border, there’s a good selection of Mexican cuisine, including the Tucson classic Sonoran hot dog, best served by parking-lot vendors. There’s also some great coffee roasters and a few fabulous microbreweries. I’ve selected some favourite eats and drinks in my best-of-Tucson list below, with individual reviews coming in the weeks ahead. This entry was posted in Arizona, beer, breakfast, road food, road trip, Road trip food, Tucson, Uncategorized and tagged Tucson Arizona on April 21, 2017 by bcorbett907.